We’re keeping busy this month with lots of incredible trade shows and events. In addition to 3D printing and manufacturing events, we’ll be attending trade shows in the jewelry and aerospace industries. We hope to see you in California, Las Vegas, London or Austria this May! Maker Faire Bay Area takes place on Saturday May 16th and Sunday May 17th in San Mateo, CA at the San Mateo County Event Center, Make:Labs Structure. 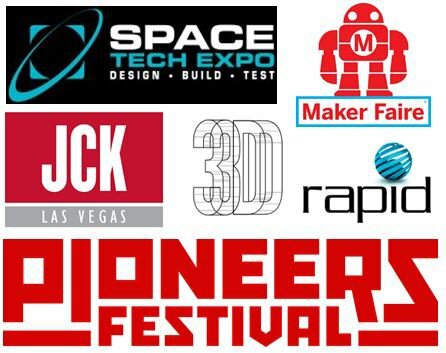 We’re excited for the 10th annual Maker Faire, and we can't wait to get out to the Bay Area to see what the maker community has been working on. If you've never had the opportunity to see us, come visit us in the Make:Labs Structure to see the Form 1+ in person. We'll also be showing off this amazing Tiny TV made from parts printed on a Form 1+. Come visit us on May 19, 2015–May 21, 2015 at the Space Tech Expo in Long Beach, CA at the Long Beach Convention Center, Booth # 7008. Space Tech is the West Coast's premier aerospace technology event. Come visit us at Booth # 7008 to see what some of our users have been creating with the Form 1+, including drone prototypes and highly-detailed, accurate models of some of the world's most well-known spacecraft. Get a preview of the drone that we’ll debut at the event by checking out our blog post on the making of the MRB-1 drone. Rapid, North America's longest-running 3D printing and additive manufacturing event, will take place from May 19, 2015–May 21, 2015. We’ll be at Booth # 660 at the Long Beach Convention Center, as the event is co-located with Space Tech Expo. Last year, we debuted the Form 1+ to the public for the first time at Rapid, and we’re excited to be at the event again. See what we and some of our users have been up to, including some really amazing industrial applications like Empire Robotics and Sutrue. JCK Las Vegas is one of North America’s premier shows for the jewelry industry. We’ll be at the event from May 29 2015– June 1, 2015 in Las Vegas, NV. Learn how your jewelry business can benefit from 3D printing with the Form 1+ 3D printer. The show takes place at Mandalay Bay Resort & Casino and you can visit us at Bayside, Level 1 - B6675. We’re back at this year’s 3D Printshow London from May 19th –May 21st. 3D Printshow brings together makers and innovators from across every aspect of the 3D printing ecosystem. Come visit us at Stand PR-10 at The Old Truman Brewery to see the Form 1+ in person. Formlabs will be in Vienna, Austria from May 28th - 29th 2015 for Pioneers Festival. Come visit us at Europe's major conference for future technology and entrepreneurship that brings together a community of over 20,000 entrepreneurial shapers. The festival is located at Hofburg Imperial Palace. Formlabs' Product Lead Dávid Lakatos will speak at the AcademyStage Program on Friday May 29th. We will also be hosting our first Austrian meetup at HappyLab, Austria’s first makerspace.